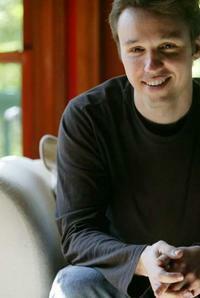 I first saw Markus Zusak when he still had pimples, giving an author talk at a Sydney library. Way before he’d written The Book Thief. Having read The Underdog, I knew Markus had a way with words. But The Book Thief is unique and will surely acquire the status of a classic. I knew it was a specially crafted tale when I first read it in 2005, and am so glad it’s finally going to be released as a motion picture. Why is The Book Thief special, besides making me cry? It’s not just the story, but how it’s written. I could tell you The Book Thief is narrated by death (yes, death), set in Nazi Germany, and is the story of a young girl who steals books and lives with her foster parents who protect a young Jewish man at their peril. You would correctly assume the topic to be dark and depressing. See what I mean about unique? ‘Curtains of rain were drawn around the car’, ’empty hat-stand trees’, ‘delivered by a soft, yellow dressed afternoon’, ‘coat-hanger arms’ ,’murky snow spread out like carpet’, ‘the crowd did what crowds do’. This is only a small sample from the first few pages. Not-leaving: An act of trust and love, often deciphered by children. 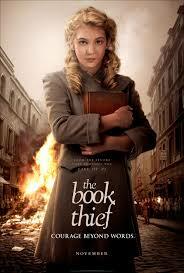 Another of The Book Thief’s strengths is point of view. Death contemplates humanity in this sordid period of history, as only death could. Experience the richness of how all Zusak’s characters react to their desperate situations, especially children, even the well-meaning Germans. If you haven’t read The Book Thief, do yourself a favour and read it before you see the movie (which I’m sure will be wonderful). Savour it, don’t rush reading this treasure. Been wanting to say that for ages. Has anyone read it? 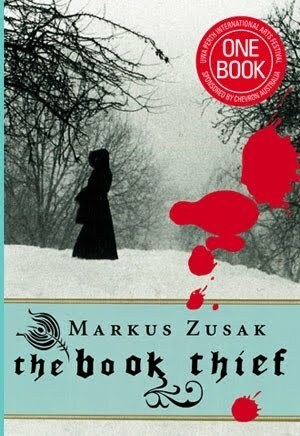 This entry was posted in book review, Markus Zusak, The Book Thief and tagged Markus Zusak, Nazis, The Book Thief, WW2. Bookmark the permalink. Thank you! Boater or fedora? I was thinking of a stetson…. Hello Mick. I’m very proud to say I introduced Lee-Anne to The Book Thief. While I found Death as the narrator quite affectatious and annoying initially, I soon forgot this as I got further into the text. I’ll be seeing the film soon but I know it won’t be as good as the book (it never is). I agree. It’s because we have great imaginations, ha ha. I hope the movie does it justice. Go Geoffrey! I haven’t read it but I certainly will now! Thank you! Not yet. Where to find the time? I know, but this book hadn’t sold 8 million copies for nothing! Okay, another for my to-read list. 25 million, is that all? You could cheat and take she who shall remain nameless, but not sure if the word magic will shine through. Sush! The Nameless One must not be named. Never know when she is listening. Obviously I need to do another yoga post this weekend. I was referring to seeing the movie vs reading the book, didn’t make that clear. Ah. All is clear, now. Still trying to find the time to finish the last 30 pages of Arafura. Not going to happen tonight. Pleasant dreams for me! I’ve actually had this on my nice big reading list for a while. The title caught me immediately. Thanks for the push 🙂 cheers! Its on my list. I cannot wait to read it. Soon! Great post! I definitely plan on doing that, Susan. snowing here…might be a good day for a movie…Would rather read first as you say…but, probably won’t happen! I wanted to catch the movie. I knew nothing about it until a friend pointed me to it. I should get the book. Great review. Did you ever watch Rush? No, but have just jotted it down and will investigate at DVD store this weekend. 🙂 Will get back to you. I saw the movie a few days ago. It is a GRAND movie. The actress, Sophie Nelisse is wonderful and Death is also very captivating. I haven’t read the book yet, but if it is as usual that the book is better than the movie than it should make for an outstanding read. Hello Carol, found you via Suz Jones’s blog. Thanks for following me! I was just told that the movie got bad reviews so must go and see for myself. Was wondering how Death would be portrayed in the movie. Ever since Mamma Mia got 2/5 stars I don’t trust reviews, ha ha. I’m reading The Book Thief at the moment. I’m determined to finish it before I see the movie. That way I can compare how it is created by the director to how I think it should be done. Always prefer to read first when I ca otherwise I find my reading interpretation is tainted by the screen image in my head (which is someone else’s interpretation). When I saw “The Book Thief,” my heart skipped a beat over the idea of a world where books are considered so valuable that people steal them the ways they steal stereos and TV sets. Thanks for following and dropping by. I saw the movie last w/e and was reminded of the same thing. Imagine before the printing press! I cried in the movie, scared I was going to howl. My daughters were the same. Did you see the review I did on the movie?